Dalagrisen will eat you alive. The music alone deserves a cdc! Nice report! 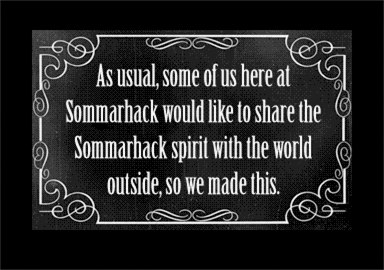 I have to attend Sommarhack next year. epic fail on my thumb down too. that may be because that party report rocks. Nice to see picture of Swedes eating sausages. A witty and novel upgrade to the whole concept of what is called a 'slideshow'. Dullness was avoided and it made me smile. It leads me to ask the big question, when are we going to get the next full sized proper demo from Excellence in Art? @CIH yeah we want talktalk3 already! Fine presentation, as always with mister XiA (aka "STe Powerpoint Man" ;). Quality of the photos is a bit low (or is it my monitor ? ), but at least they're in colour this time, the arrangement and the taglines are funny, it's all very stylish, the soundtrack is neat and i do like the surprising end. In other words - I like it! page created in 0.014488 seconds with 15 queries.